Plastic surgery is any procedure performed to improve or enhance the body’s natural appearance, or restore a more normal appearance. Cosmetic plastic surgery narrows the focus to the former, while reconstructive plastic surgery deals with the latter. Many people who are unsatisfied with one or more aspect of their appearance turn to cosmetic plastic surgeons to improve the way they look and the way they feel about themselves, including individuals here in Little Rock. Plastic surgery can involve body contouring, the reshaping, repositioning, and tightening of almost any aspect of the body. With the help of these procedures, you can achieve a refreshed, rejuvenated, and natural-looking appearance. Will my plastic surgery procedure leave a scar? Scars are a part of any surgery. For most plastic surgery procedures, making incisions in inconspicuous places conceals scars. In breast augmentation, for example, incisions can be made in the armpit so that any resulting scars are naturally hidden. By scheduling an initial consultation with Dr. Branman in our Little Rock, Arkansas Cosmetic Surgery Center, you can learn how scarring can be concealed or lessened after your breast surgery, or any other plastic surgery procedure. What kinds of procedures do Cosmetic Surgeons perform? Cosmetic Surgeons perform a wide variety of procedures that are designed to enhance or improve the natural appearance of the body. Whether they are performed to provide a refreshed, youthful new facial appearance, or to improve the body’s contour or shape, cosmetic surgeons can improve almost any aspect of your body that you are not satisfied with. The results you receive from your Little Rock plastic surgery depend a lot on the cosmetic surgeon you choose to perform the procedure. Depending on the skill of the cosmetic surgeon and your preference, your results can be very subtle and natural or more extensive. 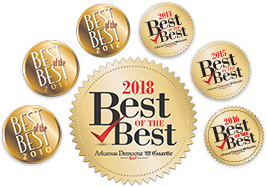 To learn more about the results you can expect from your plastic surgery procedure, contact the Cosmetic Surgery Center in Little Rock. Plastic surgery options will be explained in full during your initial consultation with Dr. Branman. What should I ask during my consultation?